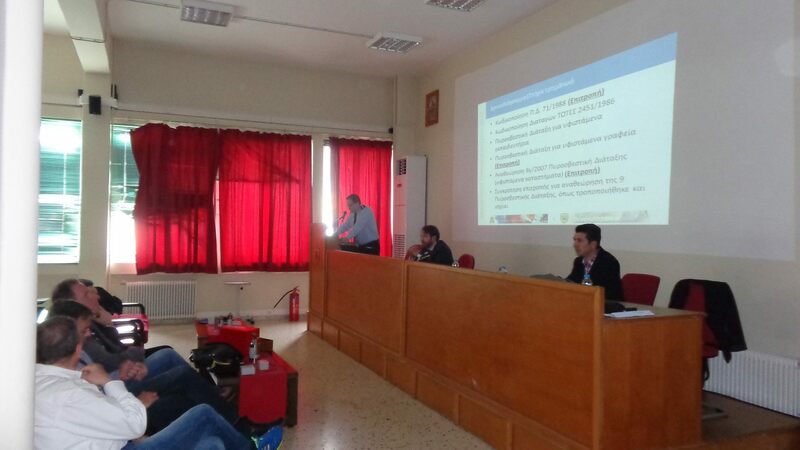 Last week we participated in a presentation of the Aerosol Norms ISO15770 & CEN/TR 15276 at the Greek Fire Brigade Academy. FirePro Hellas S.A., a subsidiary of FirePro Systems, having accepted an official invitation by the Greek Fire Brigade successfully gave a Presentation at 28/04/15 of the new Aerosol Norms ISO15779 & CEN/TR 15276 that have been recently officially adopted by a Greek Law FEK 3149 brought into power from 01/03/15. The presentation took place at the Fire Brigade Academy and many Fire Brigade officers of Attica fire departments along with the final year Fire Academy students participated. FirePro is the only company worldwide that possesses European and International Certifications (CEN/TR, UL, IMO, etc).